Pesto must be one of the most popular sauces in England today. It is delicious and it’s so easy to make. You don’t have to buy it in the bottle. All you need to do is take those very Italian ingredients of pine nuts, basil, olive oil, pecorino cheese, and garlic, and grind them to a paste and put it in the fridge. And there you are. It’ll keep for a few days and it’s delicious. 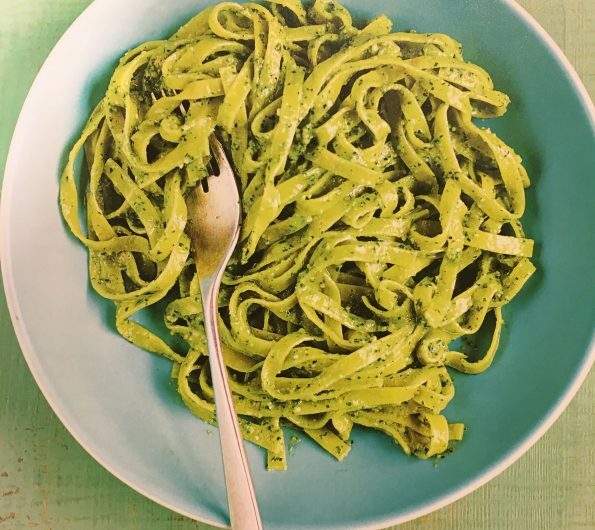 My English Pesto is a little bit lighter and has very English ingredients. So there are walnuts, cheddar cheese, and parsley, rapeseed oil, and rather un-English garlic, and lots of it, because that’s absolutely essential. Let’s start with the garlic.If I want to peel garlic, I always just give it a bash first because then it makes the skin come off it really easily. And you don’t need to chop it up very much, because the processor will do that. Put it in the processor. Parsley- a lot of it!! And the parsley, again, doesn’t need to be chopped up very much. They’ve got more flavour in the stalks than there are in the leaves so I like to put the stalks in, or most of them. But you need to chop the stalks fairly finely, because otherwise they get stringy. You put the parsley in, give it a bit of a whiz. Add the Walnuts and finally the cheese. (To be honest, I just always guess the quantities because sometimes you want your pesto to be more herbal with more parsley and less cheese, and sometimes you want it to be quite rich and cheesy). Add the oil and season with salt and pepper. And that’s the English pesto. Once you’ve got your pasta boiled and properly cooked, drain it and then as soon as you can, get the sauce onto it because the sauce will stop it sticking together. If you have to leave it for a long time, then it’s a good idea to put a tiny bit of oil in it and just mix it all through to stop it sticking. Put pesto in it and give it a mix up. There we are. That’s English pesto.